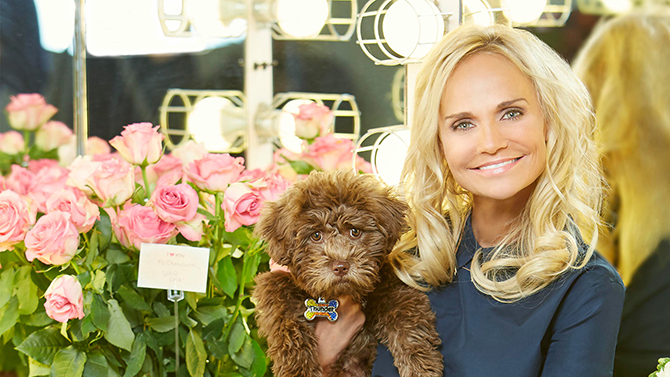 Leading a busy life as a Broadway and film star, Kristin Chenoweth has found solace in her rescue dog, Thunder. As a Remember Me Thursday ambassador, Kristin is using her platform to give a voice to the voiceless. With her award-winning voice, Kristin Chenoweth has graced the Broadway stage delightfully charming her way into our hearts; she’s been a hit too in Hollywood, with popular roles in movies, and TV (“Pushing Daisies”.) But her star turns as Glinda the Good Witch in Wicked, and Sally Brown in You’re A Good Man, Charlie Brown have made Broadway magic. Kristin’s love for animals goes back to her childhood. She grew up with dogs, a cat, and a bird named Johann Sebastian Bach. But it doesn’t stop there; many of her relatives were farmers, allowing her to fall in love with all types of farm animals. So, it’s no wonder Kristin is rarely seen without Thunder in tow. Thunder is quite the traveler, noting that she is particularly fond of Cabo San Lucas, the Mexican resort just a quick hop from L.A. Kristin says, “Getting to go in the ocean, and to splash around in the pool whenever she’s hot…she’s just a Queen bee there.” And Thunder’s travel essentials? Her expandable bowl, food, and treats! Kristin would love to grow her furry family, however her constantly on the go lifestyle restricts her from doing so. And when she can’t bring Thunder along for the trip? She only trusts a handful of friends and her assistant, Seph, to look after the pup. Kristin describes Thunder as her emotional support animal, and she is exactly that. In return, Kristin spoils her with love and affection. They travel the world together, dipping their toes (and paws!) in the ocean. When they aren’t soaking up the sun in Cabo, Kristin finds herself busy with her career. In the face of exhaustion, it is those loving glances from Thunder that console Kristin. After all, “The love that you get from an animal is unconditional.” It is this love that has inspired Kristin to work with Remember me Thursday in raising awareness for pet adoptions. Hailing from New England, Jaclyn Waller is a recent college graduate with a BA in Communications from Manhattan’s Pace University. Currently a writer, she possesses a strong fashion and arts background as a model, actress, impressionist painter, and former Assistant Lifestyle Editor of Mood of Living.